Shop My Good Greetings online at MyGoodGreetings.com where they believe that special celebrations, events, thank you cards and even personal letters warrant being printed on paper to make a lasting impression. They believe in great design and in making environmentally good choices. 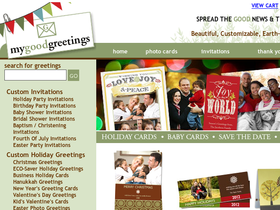 MyGoodGreetings.com was created to fill an important niche that was missing from the custom photo cards, invitations, and announcements available – eco-friendly products. Visit 58Coupons to learn how you can save with Mr Good Greetings coupons, My Good Greetings promotions and My Good Greetings discounts for MyGoodGreetings.com. Enjoy savings of 15% at MyGoodGreetings.com on orders over $79. Click code to view. Use this coupon code from MyGoodGreetings.com to get 10% off your order. Use this link to save $10 from My Good Greetings on orders over $89. Click link to view. At MyGoodGreetings.com you can get a huge variety of address labels for only $0.30. Click link to start saving.